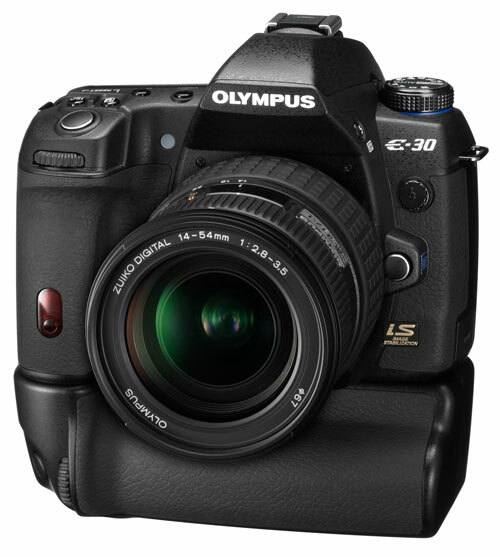 The unnamed prosumer DSLR Olympus was showing as a prototype at Photokina was announced today as the E-30 DSLR. The E-30 fills a large void in the Olympus line between the $649 E520 kit and the $1699 Pro-oriented E-3. Everyone who wondered when Olympus would migrate their fast 11 dual cross-point AF module to a consumer grade camera finally get that choice in the E-30. Olympus even claims AF speed just as fast as the E-3 when the E-30 is used with Olympus SWD lenses. Also featured is a 98% optical viewfinder with a real pentaprism, significantly upgraded from the pentamirror of the E-520/E-420. The very useful tilt-and-swivel LCD is also migrated from the E-3 and increased in size to 2.7 inches. 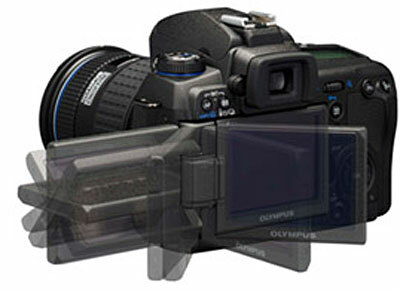 Olympus specifies the new LCD as 100% view in Live View mode with magnification up to 10X for fine focusing. Live View Auto Focus is also claimed to be extremely fast, which would mean this Olympus-developed feature is finally evolving into a truly useful shooting mode on the DSLR. 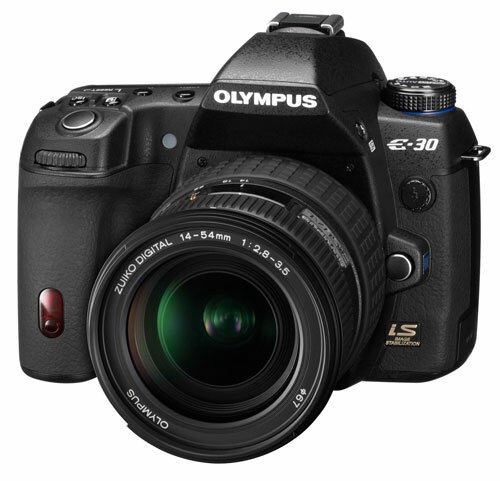 With the new 12.3 megapixel Live MOS sensor the E-30 will be the highest resolution DSLR in the Olympus line-up. It appears the sensor is the same used in the Panasonic G1 interchangeable lens digital that uses Live View mode for all focusing. Panansonic and Olympus claim AF speeds in Live View with the new sensor are the fastest available in any contrast-detect AF system. The speed appears fast enough to make Live View a useful shooting mode instead of just a check-list feature as it is on most current DSLR cameras. Unique features of the E-30 include multiple-exposure capability, a Digital Leveler that will be particularly useful for architectural photography, and art filters for getting creative with the image. Image Stabilization is built into the body and it is an auto-switching two-plane system that is said to provide up to 5 stops improvement in hand-holding in low light. The E-30 also features auto-sensor cleaning pioneered by Olympus. The E-30 will ship in January 2009 as a body only at a suggested retail price of $1299. Also shipping in January is the new 14-54mm f/2.8-33.5 II lens that supports the fast contras detect Live View AF. Fast Live View AF is also supported with 25mm f2.8 pancake lens, 14-42mm f3.5-5.6, 40-150mm f4.0-5.6, and 9-18mm f4.0-5.6. The E-3 is their top model. Unique features, higher ISO ability with this new(12.3mp) sensor and traditional style DSLR. Higher ISO ability is becoming more common than in the past. This sensor at 12.3mp is the same as the one in Panasonic G1 that has a 12.1mp(effective) sensor. This means the Olympus E-30 is using the full sensor as compared to the G1. 3/4" size VS "C" does not mean anything unless there is a quality difference. This new 3/4" sensor does challenge the slightly lager "C" sensor in all areas of quality photos. Perhaps this will help lower the prices of Nikon and Canon? Challenge does not mean "equal". Smaller sensors will always be at a disadvantage when compared to larger sensors. The reason why most point and shoot cameras have adopted a 4/3 format is because it requires fewer pixels. therefor, the sensor is cheaper to make. Since 8 x 10 is still a common format, as is 8.5 x 11, almost the same, it seems like a good idea. Of course, long ago, minilabs, such as the one I had,went to the larger 6 x 8 format. How are most people getting their prints these days? No consumer lab had printed 4 x 5's for many years. 3.5 x 5 was the popular format. The same thinking went into the 4/3 format from Olympus when they were first working on it. "A compromise between size, weight, price, and image quality". These cameras were never intended to compete directly with the APS-C models. he problem with it was that until now, with this new Micro camera size, the cameras were no smaller than the APS-C cameras, cost about the same, weighed about the same, but did have lower IQ. These new models balance out the equation. The IQ remains the same, but the rest promised years ago is finally here, except for price, which is still much too high. It's interesting that with the new red and blue models, they are acknowledging that sales of this camera isn't really to the serious amateur, but is rather an upgrade from the colorful point and shoots. Better drop the list to $799 for those sales to materialize. I agree with your comment => Challenge does not mean "equal". I am looking for a camera. I am reading as much as possible but do not have experience with good quality cameras. My camera is a Panasonic FZ8. The quality of this camera's photos are top's compared to my pocket camera. What I am looking for is to take the next step forward. I am not willing to spend more than $1000. I like taking Macros of flowers, Zoom in on Birds and family photos. I need to know how much of a zoom a 45mm-200mm lens will give or is a Kit lens good for general photo taking. Reviews are good but I need to learn more about every aspect. It's not simple if you already have lenses, as many do. If you are starting from scratch, you have to decide what you will be taking pictures of most of the time, how important those pictures are, how large you will make them, etc. Truthfully, if you shoot for yourself, and don't plan to print bigger than about 12 x 18, most any D-SLR is just fine, though I'd stay away from anything under 10 MP for that size. When you check, you have to decide if you use flash whenever you are in low lighting, or prefer more candid photos, with no flash. If the latter, then you need to check the higher ISO quality. Noise becomes a distraction. some are better than others. That's one area in which the 4/3 format D-SLRs are behind. But, it may not matter if you always shoot at ISO 400 and below. Zooms are pretty good these days, including the inexpensive ones, unless you plan on large prints of architecture, where they will fall down in quality. I usually recommend two shorter zooms with some overlap, rather than one long zoom, because you rarely need the entire range, and they are smaller and lighter, which means you will be more likely to actually take the camera with you. They will also have better quality than the longer one, which will fall when you get to the longest lengths, and wide open. A wide to short tele, and a short tele to long tele would be best. But for macro, remember that most zooms don't get you that close. You could use an adapter, but then the quality drops further. For macro, a lens labeled for that would be required, but again, some less expensive zooms may call themselves macros, but aren't really. melgross, Thank you for the info. I am now off to visit the sites you posted. Most of my photos are flowers(up close) and people, in and out doors. Most photos are printed no larger than 8 1/2 x 11 inches. Alot of people seem to think that an APS-C sensor is much bigger than the 4/3 sensor used by both Panasonic & Olympus, but in reality the 4/3 sensor is only "slightly smaller"
Noise level's wise you would be hard pushed to tell the diffrence from ISO 100-400, it's only from IS0 800 onwards were slightly more noise creeps in on the 4/3 sensor but as most people print 8x10 or 12x10 even then you be hard pushed to see anything unless you pixel peep or view pictures at 100% or print poster size which 99% of hobbyist don't. One of the problems Olympus do need to sort out thou is banding at ISO1600+ pictures need to be exposed correctly to avoid this, were as the Nikon & Canon APS-C camera are abit more forgiving. Another problem is the lack of DR thou not as bad as it once was even with the current E-420/520 & E-3 DR is still around 0.7 of a stop less than say the Nikon D90/D300 & Canon 40/50D so highlights can be easily blown and shadow detail lost on thou really bad contrasty days but in reality if you don't know what your doing even with both Canon & Nikon you can still blow & loose detail. But as the 4/3 sensor get better with every new sensor released both Noise & DR get better to. This new Panasonic 12.3mp sensor is reportly have much better noise control and much better DR than the current 10mp NMOS sensor. Am I missing something? What is the benefit to a 4/3 sensor vs. APS-C?